The Christmas season can be very stressful. There is so much to do and the time just slips by. I’ve found that breaking things down into manageable tasks is the way to go when you are trying to prepare for Christmas. Take it one day at a time and you’ll be able to enjoy the holiday season without stressing. 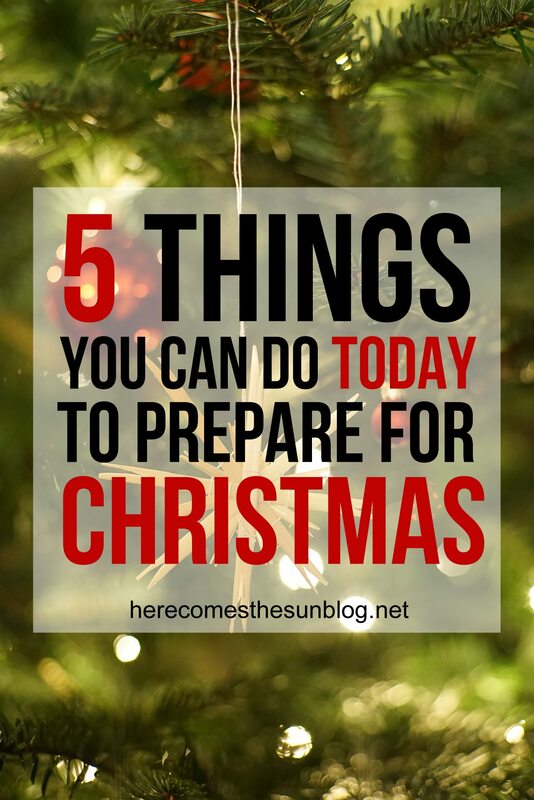 It’s hard to prioritize what to do so I have 5 things you can do TODAY to prepare for Christmas. Yes, I said it. A budget is crucial to Christmas planning. Once you know how much you can spend, you can stop stressing about surprise January credit card bills. You and your spouse/significant other must be on the same page when it comes to the budget. For the past few years, we have aimed for a cash only Christmas. It’s so nice to know that we don’t have to pay holiday bills for months after Christmas. Write down everyone that you have to buy for and one or two ideas for each person. If your budget doesn’t cover all of the gifts needed to be bought, consider handmade gifts. Or talk to your extended family about having a gift exchange instead of buying gifts for everyone. With my kids, we try hard to give meaningful gifts. I like to get them gifts based on these 4 categories: WANT, NEED, WEAR, READ. If you send holiday cards, plan to get them in the mail early. I like to set December 1 as a deadline. Your Christmas card picture doesn’t have to be taken professionally and it doesn’t have to be perfect. Last year, we used a family vacation picture. This year, I am planning on using my photography skills to take our own family picture. If you are hosting Christmas dinner, ask your guests if they can each bring a side dish or dessert to take some of the burden off of you. If you have to cook the entire meal, plan it early, and check grocery store sales to stock up on items that you will need. No running to the grocery store on Christmas Eve because you forgot ingredients! If this seems overwhelming, I have the solution! 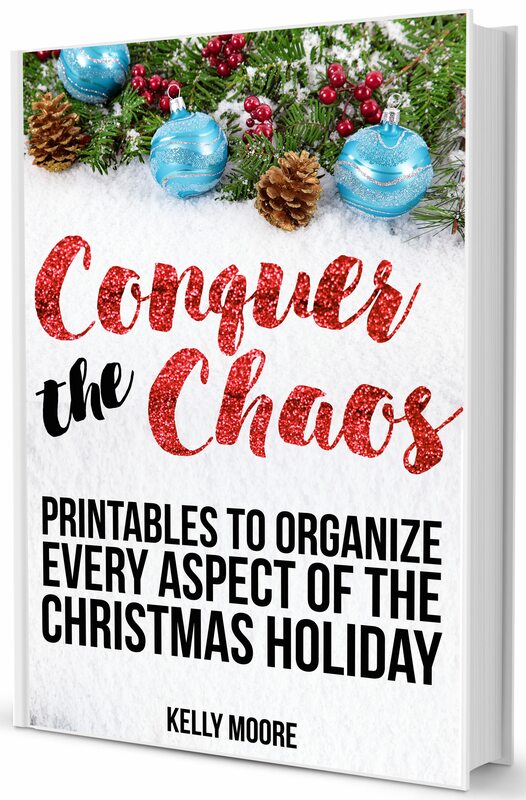 My eBook, Conquer the Chaos puts Christmas organization in reach. It contains tips and tricks to organize every aspect of the holiday season plus tons of organizational printables to keep you on track. Keep everything that you need together and organized while planning your perfect holiday. Gift lists, budget trackers, menu planners, address lists… it’s all in there. Plus probably some things that you likely always forget. The holiday season doesn’t have to be stressful. Get your copy of Conquer the Chaos today, prepare for Christmas, and enjoy less stress and more time with family and friends this season.